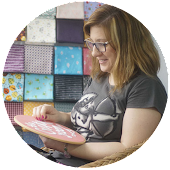 Tras cortar las piezas del top del quilt, hay que unirlas. Vamos a empezar por las opciones para coserlas y en un próximo post veremos cómo se pueden montar. After cutting the pieces of the quilt top, we have to join them. We will start by the differents options to sew them and will see how to assemble them on a next post. Bastilla: es un hilván de puntadas cortas e iguales. Metemos y sacamos la aguja varias veces a la vez y tiramos del hilo hasta que quede tenso, pero sin fruncir la tela. 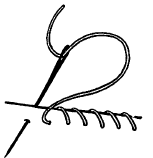 Running stitch: Take the needle in and out of the fabric several times,taking small, evenly spaced stitches. Put the needle through gently until thread is taut, but not tense. Punto de lanzada: las puntadas quedan iguales que en el caso anterior, pero se hacen introduciendo la aguja en vertical hasta sacarla por debajo de las telas y después se introduce de nuevo de igual forma para sacarla por arriba. Se emplea cuando se trabaja con telas gruesas o varias capas de tela. 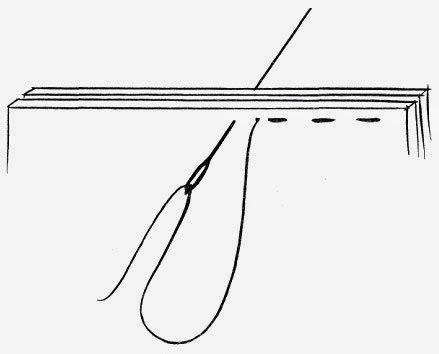 Stab stitch: the stitches are similar to running stitch. Take the needle vertically through the fabric layers from the top and pull until the thread is taut but not tense. Reverse the next stitch, coming up vertically from the bottom. It is useful for sewing several layers or thick fabrics. Pespunte o punto atrás: la aguja se introduce por detrás de donde se ha sacado, manteniendo la distancia de puntada. La costura queda más fuerte que la de la bastilla. Back stitch: Bring the needle through all the layers to the right side, then insert it a short distance behind the entry stitch. Bring it up to the right side of the fabric again, the same distance in front of the stitch from which it first emerged. Sobrehilado: se utiliza en paper piecing. Con los márgenes de las piezas doblados, pasamos la aguja atravesando los bordes de atrás hacia delante y tiramos suavemente del hilo. Overcasting: With the seam allowances folded, bring the needle through the back edge to the front, pull gently and repeat. Para coser a máquina podemos marcar los bordes de las piezas y coser sobre ellos o utilizar las marcas de márgenes de la placa arrastratelas de la máquina. 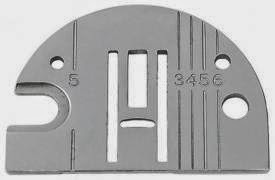 If we use a sewing machine we can mark the edges of the pieces and sew on them or use the margind marks of the needle plate. Colocamos las telas encaradas por el derecho, alineando los bordes y sujetando las piezas grandes con alfileres para que no se muevan. Cosemos a pespunte con un ancho de puntada más bien pequeño. Place the fabrics faced by the right, aligning the edges and holding the big pieces with pins so they do not move. 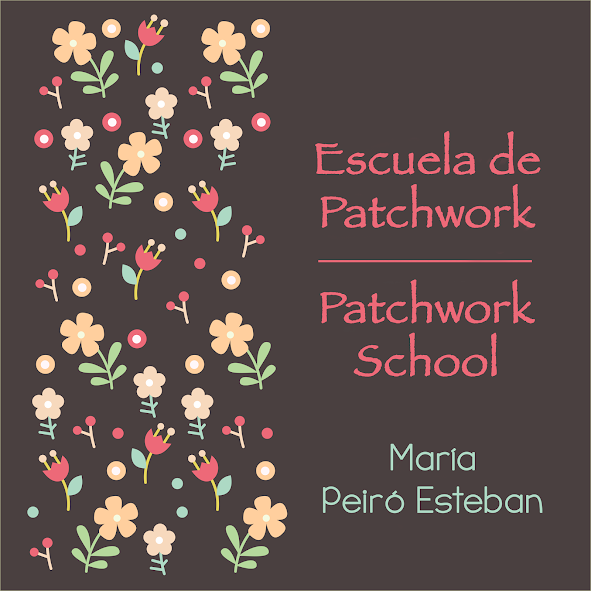 Sew with a backstitch with a rather small width of stitch. Cuando tenemos que coser muchos bloques iguales, el cosido en cadena es muy útil porque se trabaja más rápido y se gasta menos hilo. Se trata de ir introduciendo piezas, como he explicado más arriba, sin levantar el prensatelas. Después se cortan los hilos que quedan entre ellas para separarlas. When we have to sew many equal blocks, chain piecing is very useful because is worked faster and we use less thread. We have to push the pieces, as I explained before, without lifting the presser foot. Then, cut the threads between them to separate.